At the time, Olson, who ran the nonprofit Our Children’s Trust, was preparing to sue the federal government over its insufficient action on climate change, and she hoped to coördinate youth demonstrations and other events with the filing of the lawsuit. Loorz, then fifteen years old, had been inspired by “An Inconvenient Truth,” Al Gore’s documentary from 2006, and had graduated from a climate-leadership program founded by Gore. He told Olson that he was game to help, but he had another role in mind: he wanted to be a plaintiff in the case. After Olson made sure that Loorz and his family knew what they were getting into, she agreed to represent him and two other teen-age climate activists. That lawsuit, filed in May of 2011, was eventually dismissed, but it was the beginning of a legal campaign that has gained new attention—and, potentially, new significance—since the Presidential election. 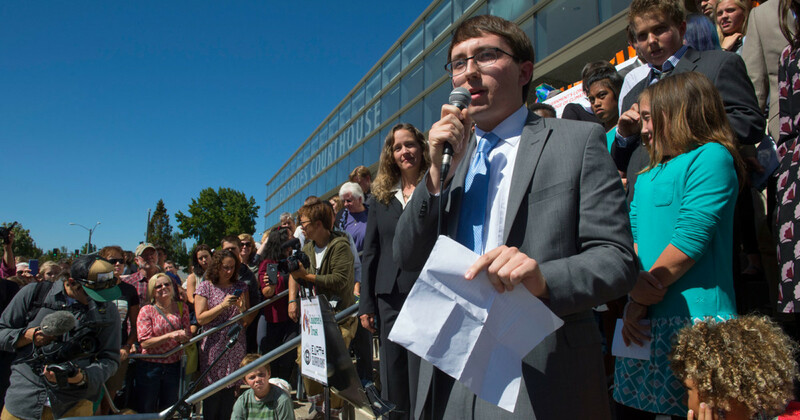 Young plaintiffs represented by Olson and her colleagues have pursued legal actions against government agencies in all fifty states, and twenty-one young people, aged nine to twenty, are part of a new suit against the federal government. Just last month, in Eugene, Oregon, U.S. District Court Judge Ann Aiken ruled, over the objections of government and energy-industry lawyers, that the suit could proceed. “This action is of a different order than the typical environmental case,” Aiken wrote. “It alleges that defendants’ actions and inactions—whether or not they violate any specific statutory duty—have so profoundly damaged our home planet that they threaten plaintiffs’ fundamental constitutional rights to life and liberty.” The trial may begin as early as the summer of 2017. Like the earlier federal suit, the new case alleges that the U.S. government has violated the public-trust doctrine—the principle, dating back to Roman law, that some resources cannot be appropriated by private interests and are instead held in trust by the government for public use. The doctrine has been part of federal case law since 1892, when the Supreme Court ruled that the state of Illinois could not grant a chunk of Lake Michigan shoreline to a railroad company. In more recent years, the doctrine has been used to prevent private landowners from blocking access to Oregon’s beaches, and to stop the city of Los Angeles from exhausting the supply of water in California’s Mono Lake. Mary Wood, a professor at the University of Oregon School of Law, has argued that the public-trust doctrine should also apply to the atmosphere; Olson and her clients are now testing that argument in court. The current case claims that the government has done both too little to solve the problem of climate change and too much to worsen it—even while knowing of the risks it poses to citizens. There is little dispute that at least some parts of the government have been aware of the causes and costs of climate change for a very long time. In the mid-nineteen-fifties, scientists funded by the Office of Naval Research warned that carbon-dioxide emissions could increase global temperatures. In 1972, the Atomic Energy Commission stated that rising CO2 concentrations in the atmosphere could “melt polar ice caps,” and that the resulting water could “inundate the coastal regions.” In 2003, a report by the Congressional Budget Office said that the burden of climate change “will be borne throughout the world by generations of people who are not even born.” The suit argues that the government, by subsidizing fossil-fuel production, has violated both its public-trust responsibility and the plaintiffs’ constitutional rights to life, liberty, and property. Like Loorz, Olson was moved to action by “An Inconvenient Truth,” which she saw when she was eight months pregnant with her first child. “I knew the facts, but seeing the visuals, seeing the whole story in front of me, was a different experience,” she told me. Some of her clients have had far more immediate experiences with the symptoms of climate change. Last August, Jayden Foytlin, a thirteen-year-old girl from southern Louisiana, became trapped in her flooded house during a severe rainstorm. (A later analysis found that the likelihood of such deluges in the region has increased at least forty per cent in the past century.) When I spoke with the Foytlins, just before Thanksgiving, they were still repairing the damage from the disaster; Jayden and her two brothers were using the living room as a makeshift bedroom. The flooding danger, their mother, Cherri, told me, has not eased. “If it rains real hard, we’ll be right back in the same situation,” she said. Jayden, however, is more concerned about the outcome of her case. “Sometimes I get scared that it’s not going to happen, that it’s going to get shut down, and that no one will take action on climate change,” she said. Our Children’s Trust and its precocious clients have already had some success at the state level. Last April, in response to a suit filed by eight young people, a judge in Washington State ordered the Department of Ecology to implement a new emissions-reduction rule before the end of 2016. (Though the state issued a clean-air rule in September, the plaintiffs argue that it is too weak to satisfy the requirements of the order, and returned to court last week for another hearing.) Three other state-level actions are ongoing, and more are planned for next year. Olson, whose previous legal work includes suing the U.S. Department of Energy over its permitting of power plants, hopes that the cases will lead to more comprehensive action on climate change—a strategy that, in some ways, echoes past litigation campaigns against the tobacco and asbestos industries. Both the state and federal cases are also part of a loosely coördinated international movement: in the Netherlands, Pakistan, the Philippines, New Zealand, and elsewhere, citizens are using similar arguments to force their governments to regulate emissions. In the United States, at least, the cases face an uphill battle, not only because they rely on novel legal arguments but also because the incoming Administration seems singularly uninterested in addressing climate change. Donald Trump has already indicated his intention to back away from the country’s commitments under the Paris Agreement, and he opposes President Obama’s Clean Power Plan, whose fate awaits a court decision. Trump has also pledged to end the current moratorium on coal leasing on federal lands, and the head of his Environmental Protection Agency transition team, Myron Ebell, has long argued against the need to reduce greenhouse-gas emissions. But it is possible that the climate-change complacency of the famously litigious President-elect will face legal opposition from a group of extremely well-informed teen-agers.